Make your own embroidered felt Winter Girl for a holiday ornament or a sweet little toy! The finished ornament is 6 inches/ 16 cm tall. 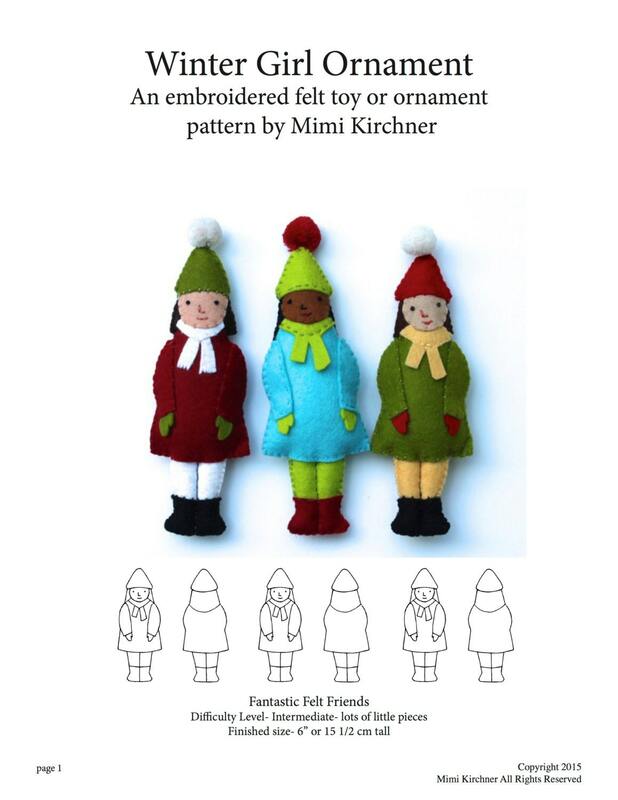 This PDF pattern is 6 pages which includes written instructions and photo illustrations for a winter girl, full size pattern pieces and templates, and sources for materials. This sewing project is rated Intermediate because of lots of little pattern pieces. Skills needed- Threading a needle, tying a knot, very basic embroidery stitches. It does require an interest in tiny detail work. Supplies needed for this project include- felt- small amounts in assorted colors. A small piece of textured fabric for the beard. Small amount of stuffing, embroidery floss to match your fabric. Basic sewing supplies like needle, pins and scissors. This pattern is an instant download through Etsy. This pattern is for home use only. You may not make products for sale using this pattern. This pattern is copyrighted and cannot be re-sold, reproduced or shared without permission. This pattern is in Adobe pdf format. Fun pattern! Enjoyed using it! The quality of the pattern is tops. Plus... just perusing her work is a joy! I accept Paypal and Etsy payments. I will often ship same-day. I do not do lay-aways. Sales tax is charged to Massachusetts customers. If there is any problem with your purchase, I will do my best to make it right. Please contact me if you feel you need to return any item. The artwork must be in excellent condition and I do not pay for return shipping costs. Each doll is unique. I do not sell wholesale or do commission work.